MIAMI - A car crashed into a discount store Tuesday morning in Miami, knocking over some clothing racks and creating a mess inside. The crash occurred shortly before 8:30 a.m. at DD's Discounts on Northeast 81st Street. Police said the driver of the car fell asleep behind the wheel and slammed his Saturn into the storefront, shattering glass and toppling over merchandise. The store was closed at the time of the crash. Neither the driver nor anyone near the store was injured. 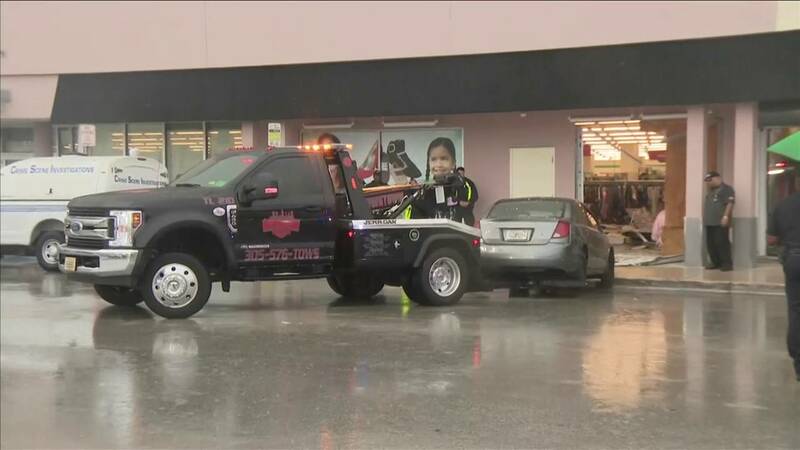 A tow truck removes a car that crashed into DD's Discounts in Miami. The car was later towed away. Workers were cleaning up the mess left inside. The store will be temporarily closed until all the debris is removed.